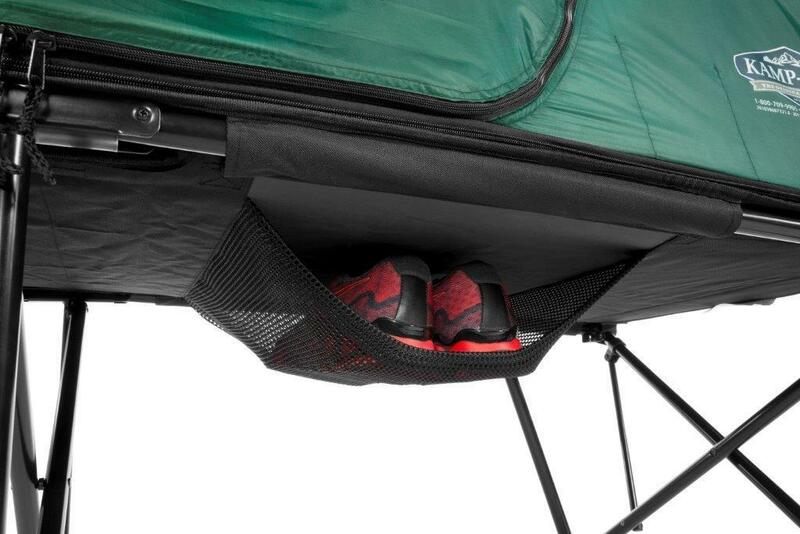 The CTC Standard (Compact Tent Cot) elevates the Tent Cot concept to the next level of off-the-ground camping gear. 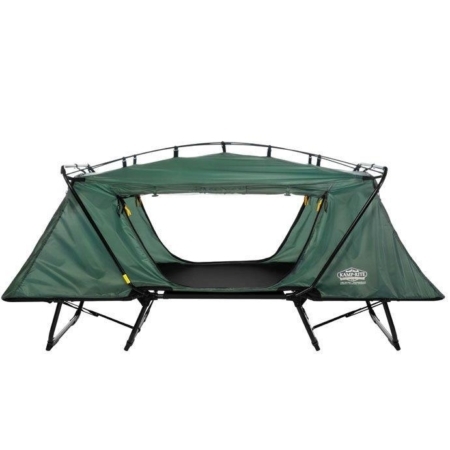 This unique 3-in-1 item combines two separate, standard camping items (a tent and a cot) into one versatile, compact package. 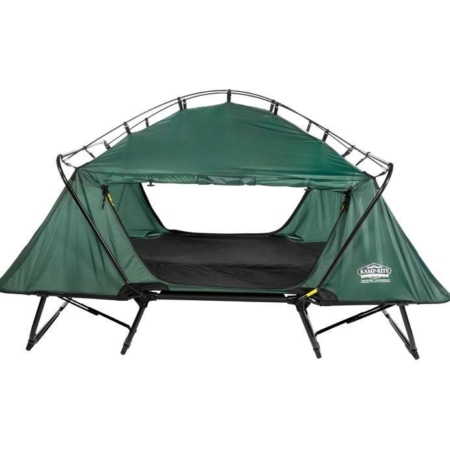 The Compact Tent Cot (CTC) Standard elevates the tent cot concept to the next level of off-the-ground camping gear. 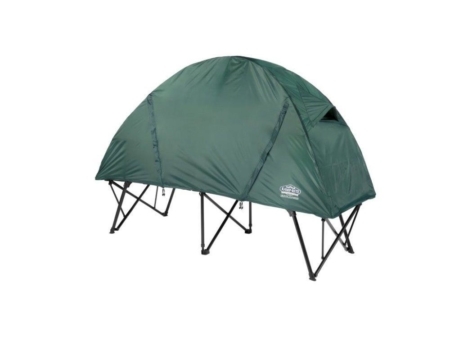 This unique 3-in-1 item combines two separate, standard camping items (a tent and a cot) into one versatile, compact package. 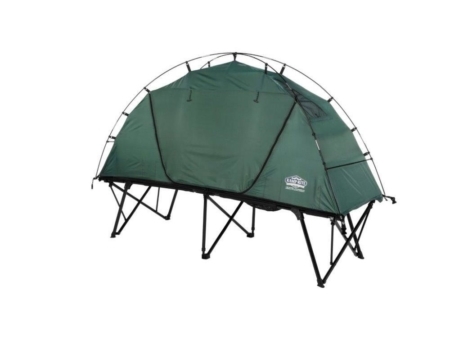 The tent top and cot join to create a comfortable off-the-ground sleep shelter and spreader bars located at each end of the tent top keep the top fully expanded for maximum interior space. 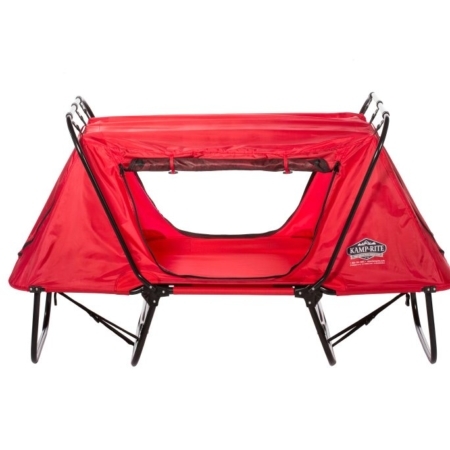 When detached from the cot base, the tent top becomes a compact, lightweight one-person tent on the ground. The remaining cot base can then be used independently as a typical sleeping cot. 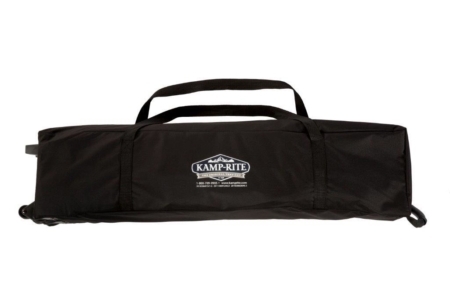 Extremely compact, the CTC Standard comes complete with a Kamp-Rite® Rain Fly and Roller Wheeled Carry Bag for convenient storage. (Sports) This is a fantastic conecpt. I am currently in the Bermuda Regiment. I am in the boat section of support company. During weekend camps that we have once a month we travel to an abandoned warehouse that we store our boats in and we sleep there throughout the weekend. The problem is that the warehouse, along with almost the entirety of the rest of the abandoned naval base that it’s on, is in a state of disrepair. Every year we do a little bit to make it better but nobody has done any work to the roof in donkey’s years. This makes for an interesting situation when it rains since the roof of the building is very leaky. I’ve been woken up in the middle of the night several times by rain water dripping on me in a steady stream. Also, there is the odd occasion where we have to create makeshift tents for ourselves when we sleep out on one of the islands. Now I can stay warm and dry throughout my rest periods thanks to the tent cot. Definitely worth every penny. Though, I don’t think that I’d want to have to go on a hike with it on my back along with the rest of my gear. Thankfully, my section doesn’t have that issue. Also, I’d like to note that the size of the cot is great for me. I’m 5’11 tall and weight about 155 lbs. I fit inside the item with great ease. This cot is slightly longer than the standard military issued cots that we have. I have had one of these tent cots for several years and it is ideal for my use. I use it in Haiti when I take mission teams back into the mountains of Haiti. 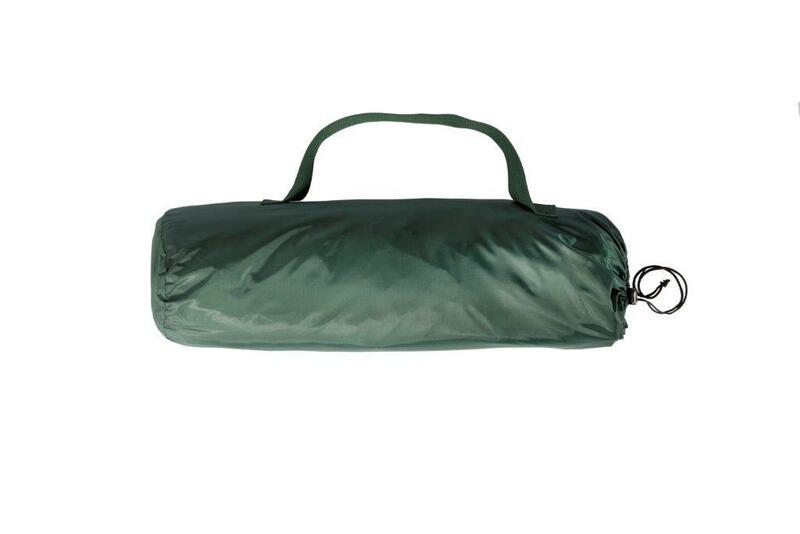 It is easy to transport and keeps me up off the ground and protected from mosquitoes. Customer service is first rate. I recently had one of the tent poles splinter. I emailed the company and received a response very quickly, and they shipped out new tent poles immediately. I have them for my next trip to Haiti in June. I highly recommend the company and the products. 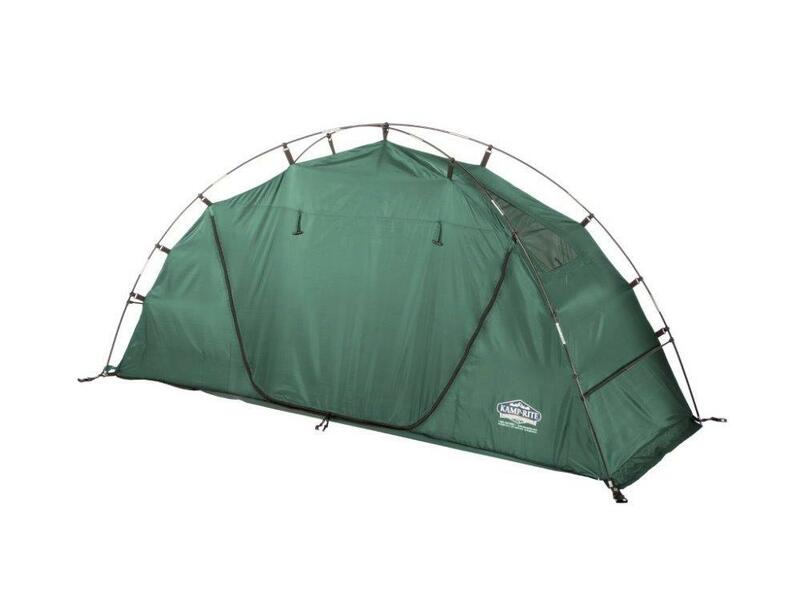 This is the perfect tent to take to boy scout camp. The camp my son attends has large fixed wall canvas tents on concrete pads. 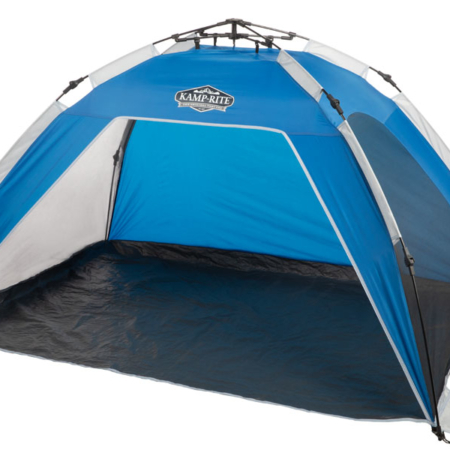 The canvas tents do not secure completely and there are consequently bugs all over the tent. This cot does not take up any more room than the standard cots inside the canvas tents, and provides much needed protection from mosquitoes and other nuisance bugs. 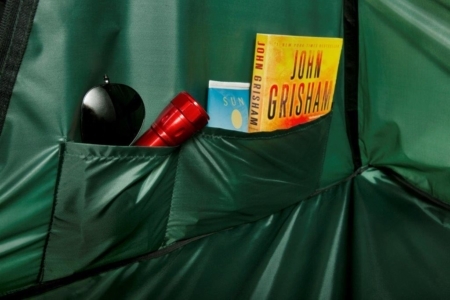 There is a small set of ties at the top of the tent portion that allow you to hang a small battery operated fan, and the vents on either end promote air circulation. 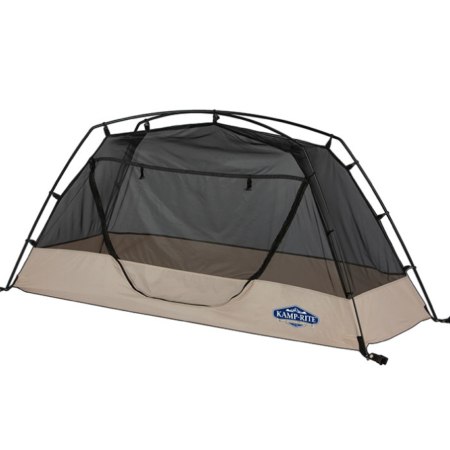 I have seen a variety of set ups at boy scout camp ranging from campers using their own tents directly on the hard concrete to other mosquito netting options over a cot. 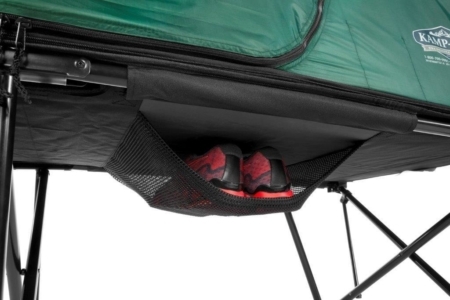 Since the tent literally zips onto the cot, this set up is the best one in my opinion. Outstanding product, and the rain fly is actually quite good as well. This tent is fantastic! It is too heavy to hike with, but the quality of construction is amazing. I have spent well over a week in this tent, literally. It is very rain proof with the rain guard on. I mean no leaks in a thunderstorm. The seams are taped over on the inside with some type of silicon tape which suggests good quality. 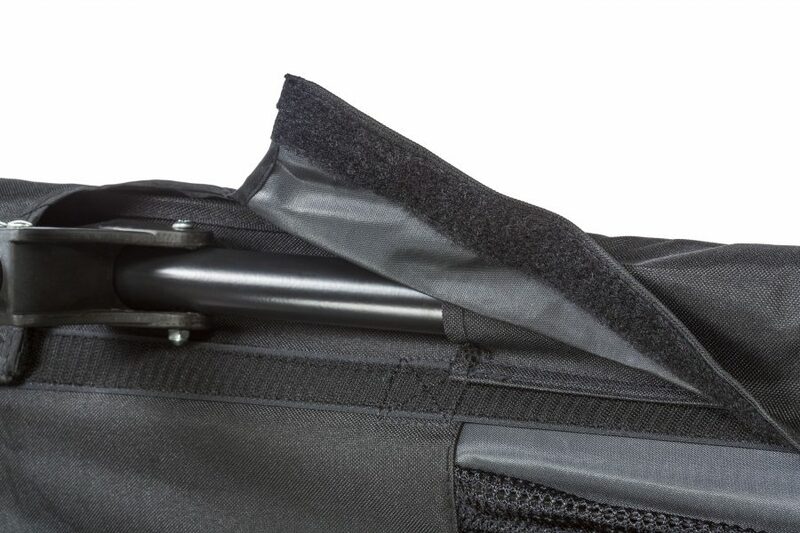 The fabric is also very thick, resilient, and resistant to mold. (Mine has been wet for over 48 hours packed up, and still no mildew.) The many windows with mosquito netting are brilliant for staying cool in the summer. The main downside is that the singlewide is a little claustrophobic, but you do fit comfortably.